While we respect the opinion of this unnamed burger lover- It’s time for the professionals to step in and evaluate this baby. The Other Place is decorated tastefully with a number of deer heads mounted on the wall. More than one confederate flag was seen in the parking lot. Most people wouldn’t think of ordering a hamburger at a gas station, but there’s something charming about The Other Place. The staff is friendly and all the customers seem like regulars. It’s like one big, happy redneck family. Order your food, pull up a stool and watch Donna cook your meal right in front of you on a flattop griddle. If you’re a first timer- help yourself to a free drink from the cooler. We heard the breakfast here is amazing, but you know the drill- we came for the burger. Everything about this burger is simple and delicious. No fancy buns or imported cheeses. No frills. Just a simple, delicious hand-formed beef patty grilled to perfection with melted cheese and topped with fresh produce. It starts with the bun. Mayonnaise is spread across the bun (not butter) and it’s placed face down on the griddle. The bun crisps up nicely on the bottom, but remains soft and delicious on top. The bun received high praise from every panel member. The beef patty is hand formed and placed on the griddle also. It’s cooked at such a high temperature that the beef develops a wonderful crisp. 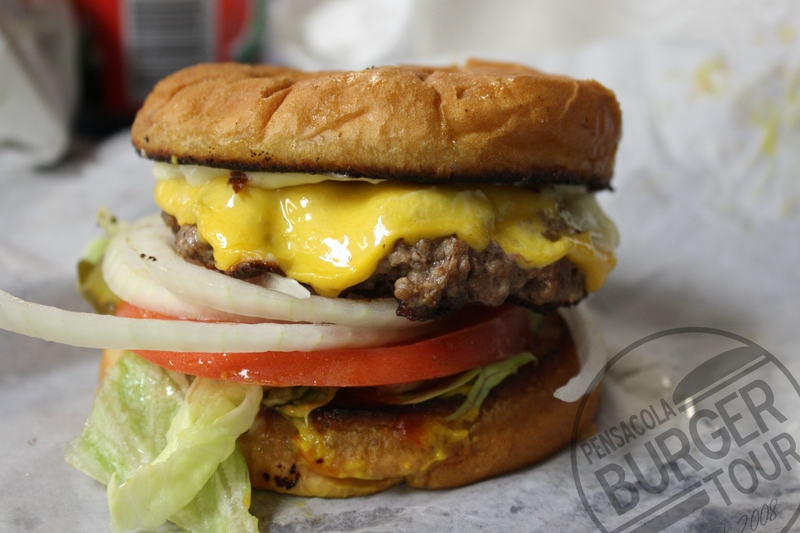 The patty is rich in flavor and topped with a slice of good ol’ American cheese. The produce is fresh and compliments the burger nicely. This, folks, is the quintessential American hamburger. Simple and delicious. It’s similar to a number of burgers you could order elsewhere- but it’s made with love- and maybe that’s what makes all the difference. Each burger is made by someone who takes pride in what they do. And it shows. This burger is, without question, one of the best things you can buy with 3 dollars and 60 cents. Period. 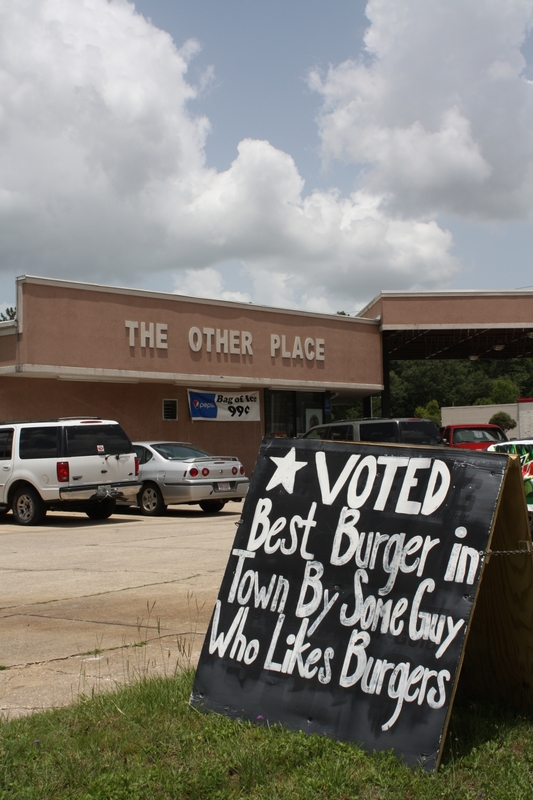 The Other Place burger finished with a final score of 8.03. That’s good enough to land it in 2nd place (for now) and should make it a top seed going into our Playoffs this August. This August we’ll see if it has what it takes to win the entire competition. So, swing by the Other Place Monday-Friday from 11:00am – 3:00pm. Order a burger. Ask about their cooler of free drinks. Let us know what you think. Then check back here next week as the Pensacola Burger Tour rolls on.